20 Very Special Reasons I Volunteer! Do you volunteer your time anywhere? Have you ever volunteered your time or resources to a worthy cause? I admit that my volunteer experience has been limited, that is until Horses with Hearts came into my life. I first became aware of Horses with Hearts after seeing their calendar at the hair salon I frequent. I’ve always loved horses, so I found the idea of using horses to provide therapy to handicapped individuals intriguing. I looked it up online, read about the program, located the volunteer forms and contacted the program. Paul decided he would like to participate as well so we attended the volunteer orientation and thus began a special experience. Horses with Hearts was founded by Kay Barkwell and Cathy Dodson. 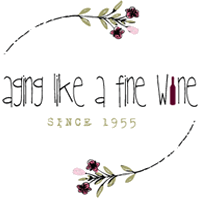 Kay runs the administrative side of the program devoting a tremendous amount of time to organizing, fundraising and coordinating lessons and volunteers. 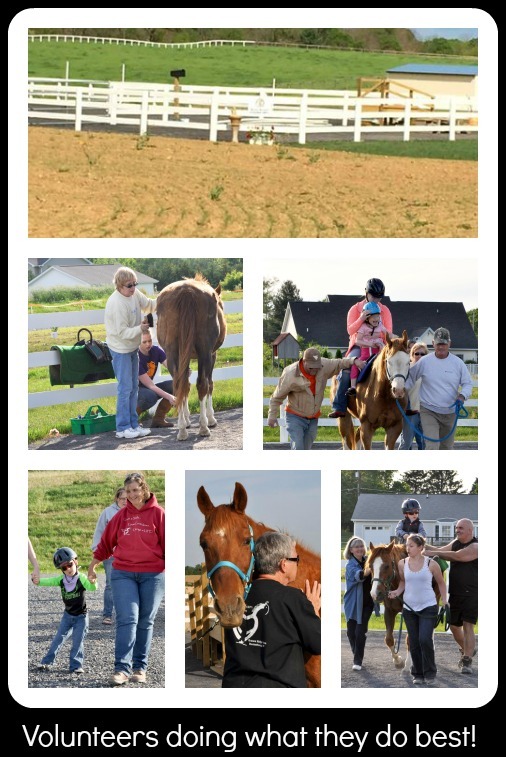 Cathy is the equine manager and primary instructor, receiving her certification through the Professional Association of Therapeutic Horesemanship (PATH) in 2007. They both still find time to do so many more things as well….painting, hanging insulation, laying sod or whatever else needs done! Even though they do all of this plus work full time jobs, they wouldn’t want the spotlight on them; they would want it put squarely on all of the special kids and adults that come out and ride the horses. The dream all began because of a special 8 year old child named Lindsay that had a huge impact in Kay’s life. She was diagnosed with a cancerous tumor on her brain stem and underwent surgery which led to her inability to walk or see. This precious young lady had an indomitable spirit and a love for horses. Her dream was to be able to ride a horse again and it was Kay’s vision to make that happen for her. Unfortunately she passed away before her dream could become a reality. Kay was so touched by Lindsay that she didn’t let her vision end with her passing, but continued to pursue and work toward a riding therapy program that would make a difference in many others lives. Thus after many hours of hard work from Kay and Cathy, Horses with Hearts was born. Therapeutic riding is more than the act of sitting atop a horse while it is led around the ring. The aim of the program is to improve circulation, posture, balance, coordination, agility and self-confidence. The motion of the horse causes the rider’s pelvis to naturally move in a manner that closely simulates walking. It exercises the rider’s spinal reflexes, especially the righting reflex and strengthens balance and endurance. Head and trunk control are improved because of the need for the rider to look up in order to see where he or she is going. 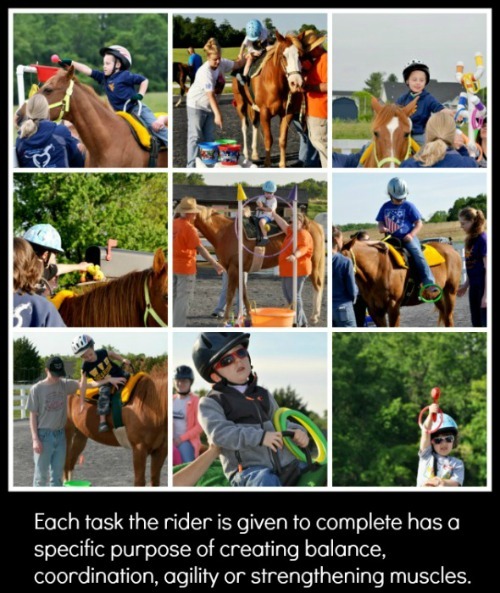 The games that are played and the tasks the riders are given work together toward accomplishing these goals. Many handicapped children and adults aren’t able to participate in the majority of physical activities. By introducing a horse into the equation, once mounted, the handicapped rider no longer looks up at other people, but he/she is on an equal visual field to other riders. This results in very positive effects on self-esteem, self-image and self-confidence. The continuing dream of those involved with Horses with Hearts is to build an indoor riding facility so the program can be year round instead of only during the summer months as it is now. They also hope to be able to provide services to local schools and veterans. The program is completely staffed by volunteers, there are no paid employees. 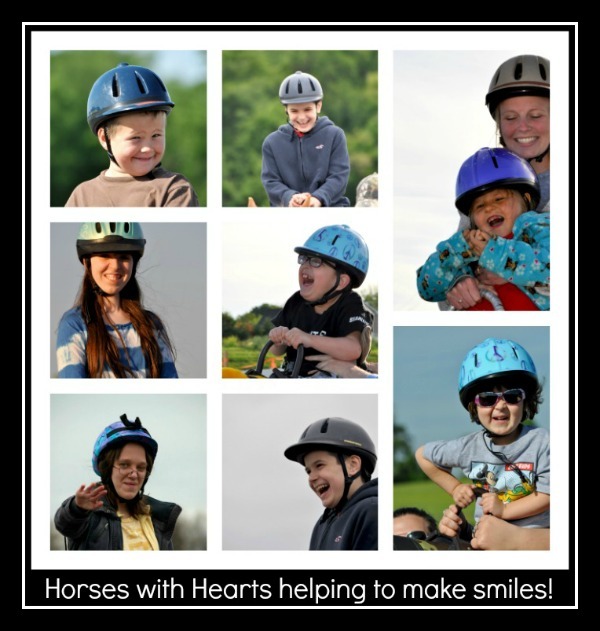 The volunteers do so many good things for so many special children and adult riders. There is a total of 13 horses either owned by the program or leased to them. The participants in the program usually ride the same horse each week and become very attached to that particular horse. The program could not exist without the horses, but as we all know, it is expensive to feed and care for horses. Expenses include feed, veterinary bills, medications, fencing and tack, just to name a few. There are many ways you can help this program and others like it without actually coming out to volunteer. A horse can be sponsored for $50 per month, a section of fence can be purchased for $60, contributions are accepted for the scholarship program which pays all or part of the cost for many participants, and the list goes on and on. 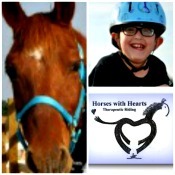 To find out more about Horses with Hearts click here. When I first started volunteering at Horses with Hearts it was the horses that drew me. Now that I have been volunteering and have gotten to know the special kids that participate, it is the kids that have become such a blessing to me and touched my life deeply. Though there are many more enrolled in the program, currently there are 20 active participants that come out to ride and they are the 20 very special reasons I volunteer! With every hug, every smile and every laugh my heart is blessed! The kids and adults that participate in the riding program face difficulties in their daily lives that most of us cannot truly appreciate. If we can reach out to them with time or resources and improve the quality of their lives by doing so, let’s do it! Each of us can make a positive difference in someone’s life!